Zisize began life as a Teachers’ Resource Centre in mid 1999 in a tiny room in an out-of-town community centre. 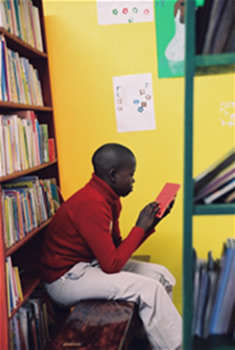 This was a pragmatic response to the gross and in some cases total lack of resources at many of the primary schools at that time, which enabled teachers to borrow books and teaching materials. Niki Lee and Hlengiwe Mthimkhulu visited the local primary schools within 15km of the centre and invited schools to become members and use the facilities. They were greeted with responses ranging from great excitement from some principals and individual teachers to extreme apathy and disinterest from others. A decision was made soon afterwards to invest energy where people showed a level of self motivation, hence the name ‘ZISIZE’ – ‘help yourself’. The contents soon outgrew the building and The Employment Bureau of Africa was persuaded to allow us to use a disused dormitory near the centre of Ingwavuma (below) free of charge, for which we are eternally grateful. Its location made it more visible to the wider community and even before opening in January 2000, children began to visit it, offering to help but staying to play with the toys & puzzles – a play centre evolved. Parents desperate for a good education for their children asked us to run a bilingual preschool class - so we did. Teachers asked for help to purchase science kits, so we bought some with money from Old Mutual and liaised with the Solon Foundation which contributed 75% of the cost for each of the member schools of Ingwavuma Primary Science Interest Group. Teachers came from up to 60km away to attend workshops with Brian Gray. That building was bought by the Department of Education, but they kindly allowed us to remain there, without charge while we built our own new centre on tribal land at KwaQatha. (below) We moved into our new home in June 2006. 1999 - Teachers' Resource Centre at out of town Community Hall run by two volunteers. 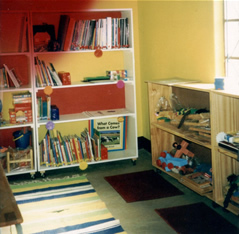 2000 - Teachers' Resource Centre at TEBA run by volunteers which was also a play facility, community lending library and pre-school class. Assistance was provided to Mpontshini School to access Operation Jumpstart funds which then enabled the building of five classrooms and a toilet block. 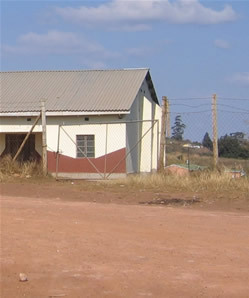 Ekukhanyeni Refuge was created in a school hut for one boy. 2001 - Change of focus from Teachers' Resource Centre to Children's Centre but retained resource facility. Volunteers were paid small stipends. Provision of subsidised science kits to primary schools. Now 4 boys at Ekukhanyeni. Discovered some children were not eating at weekends. Commencement of first weekend and school holiday feeding scheme at Mpontshini. 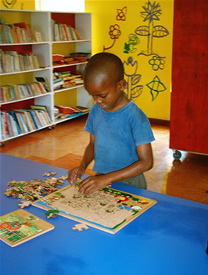 2002 - Children's Centre at TEBA continued to attract many children for play, to borrow books, attend pre-school class or to study. Began building solid construction home (Ekukhanyeni), first international volunteers, Learning is Fun Competition, first holiday play scheme, supply of water to Mpontshini School, and classroom building. 2003 - Children's Centre at TEBA. Completion of building first three rooms at Ekukhanyeni, ten international volunteers, three additional feeding schemes started, uniforms bought, more children admitted to Ekukhanyeni, additional two rooms began to be built along with a kitchen, shower, toilets and dining area. Commencement of monthly food parcels (7), provision of uniform to every child in need at Mpontshini school. 2005 - Two children's centres, 2 play facilities, 2 community lending libraries, 2 creches, 1 pre-school class (all of which are ongoing). Roofed in passageway of Ekukhanyeni and built lounge - numbers rose to 23 children. Employment of clerical assistant, book keeper, assistant social worker and intern psychologist. Food garden training and provision of resources including water at 5 schools (Mpontshini, Mgedula, Ekuhlehleni, Manyiseni, Okhayeni). 790 uniforms provided. Termly Battle of the Books Competitions. Commencement of Hero Books, Soul Buddyz and Radio projects. Provision of monthly food parcels (18). Building of KwaQatha Centre and completion of first volunteer house. 22 international volunteers. Birth of drama project. 2008 - Third vehicle. Staff numbers increase to 43. Feeding programme started for Vulnerable children in Grade 12 at Ingwavuma High School, Monday to Friday. Two child headed homes were built. Hall constructed at Mgedula and toilet block at KwaQatha (Jephcott Trust funds). 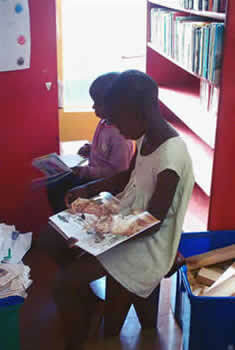 Molteno Literacy Project commenced. Mentor Programme commenced. 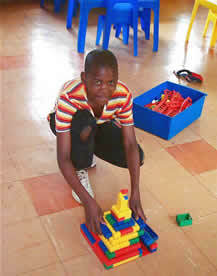 Lifeskills Clubs at each of the six partner schools.Social worker employed. First OVC Camp.Uniform for 575 children. Confidential HIV counselling and testing offered by our volunteer nurse. Training for foster carers by Lyn Lloyd social worker from Wales and Zisize's social worker. 2009 - Sports programme commenced training teachers in new sports and setting up matches and tournaments. Chess was also introduced. Career guidance counsellor employed.12000 students attended a career expo organised by Zisize and UKZN. Zisize's garden trainers and mentors helped 36 families set up their own vegetable gardens. School vegetable gardens also set up and tended by life skills club members who also provided a number of services to sick and elderly members of their communities.Three homes built for vulnerable households. Toilet blocks built at Ingwavuma High and Entabayengwe Primary schools. 2010 - New office block for psycho-social team (Operation Jumpstart).Bursary support started in earnest for OVC studying at university.3 boreholes provided. 2 more houses for child headed families. 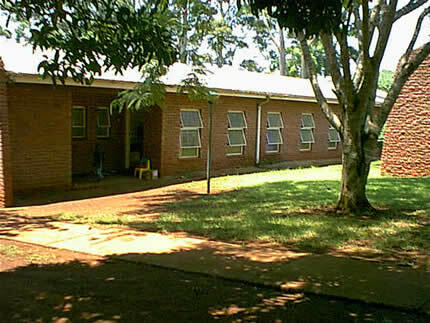 Seventh partner primary school added (Mbalekelwa). Peer educators employed via Dept of Labour scheme at 3 high schools. 2011 - Employment of full time nurse. Commencement in earnest of HIV awareness campaigns and community dialogues using Forum theatre techniques to encourage participation in debate and dialogue. All staff take 10% pay cut to ensure all projects kept alive during funding crisis. 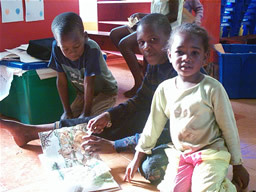 32 children at Ekukhanyeni. Numeracy training for teachers commenced. 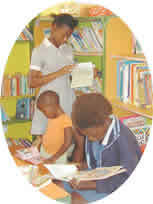 2012 - Two additional primary schools (Mayaluka and Our Lady of Ingwavuma) included in education programme and mentor activities. Garden training increased - now 100 families have organic garden, some with fencing. Second social worker employed.